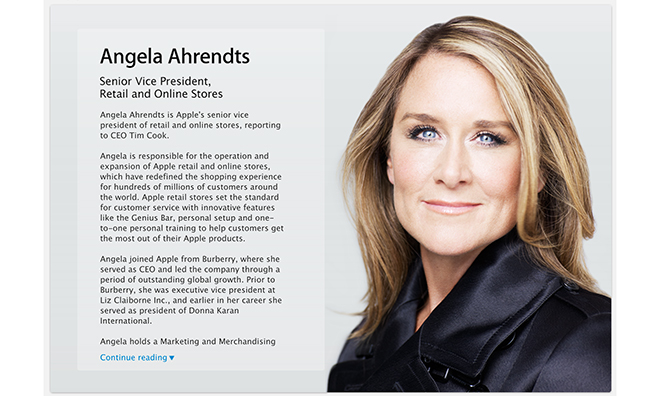 After officially joining the company last week, Apple's new SVP of Retail and Online Stores Angela Ahrendts has received more than 113,000 restricted stock units currently worth more than $68 million in common shares. According to a filing with the U.S. Securities and Exchange Commission, filed on the same day that Ahrendts was given an official bio on Apple's Leadership webpage, the new head of retail received 113,334 RSUs broken up into five parcels. The document was first spotted by MacRumors. At current AAPL share prices, the RSU bonus is worth more than $68 million. As with other top-level executives, Ahrendts' restricted stock will vest in varying intervals over the next four years, with the first batch scheduled to vest in June. According to the SEC, the first allotment will convert 26 percent of a batch of 62,555 RSUs into common stock that, if traded today, would be worth $9.78 million. The remainder of Ahrendts' largest package will vest as follows: 32 percent on April 1, 2015, 21 percent on July 18, 2015, 15 percent on June 14, 2016, 3 percent on June 14, 2017 and 3 percent on June 14, 2018. One third of another 33,476 RSU chunk will vest on May 1 in 2015, 2016 and 2017. Performance-based RSUs in "target number" batches of 5,817, 5,739 and 5,747 RSUs will vest on May 1 in 2015, 2016 and 2017, respectively. Depending on Apple's relative shareholder return from May 1, 2014 through the vesting date, the actual number of RSUs converted to common stock will be between 0 and 200 percent of the target number. Apple routinely offers its leadership team RSUs as a way to incentivize continuous positive performance, the latest being a nearly 36,000 RSU bonus meted out to executives in March. Now that Ahrendts is part of that team, she too is receiving the same treatment.